Students and helpers working on the early stages of the garden last month. 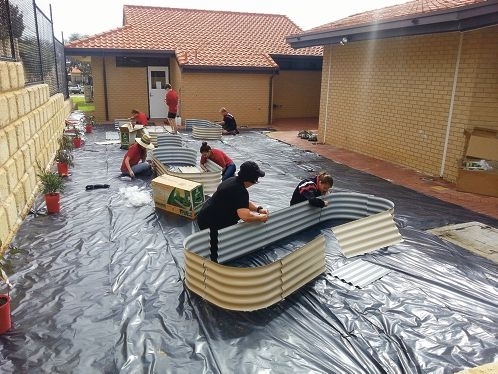 Environmental science teacher Anita Relo-Fisher, Year 7 and 9 students and four helpers from Bunnings Joondalup, two who were ex-college students, have worked on the garden. ‘It will be a place to learn how the Aboriginal people used their natural environment not only for food but to provide shelter and medicine,’ Mrs Relo-Fisher said. Mrs Relo-Fisher said members of the local Nyungar community would be invited to share their knowledge and stories of the area. The garden would also be used during events such as Sorry Day and Naidoc week, leading to a better understanding of Nyungar culture and society. A grant from the Aboriginal Affairs Department PALS (Partnership Acceptance Learning Sharing) program helped fund the Joondalup College’s project.